ZHdK Connecting Spaces What’s Next? Panelists: Jens Badura, Dominique Lämmli, Lee Chun Fung, Johannes M. Hedinger, Isaac Leung, Li Zhenhua, Jörg Scheller, Zhang Yehong, Yung Long Song, Cao Dan, Michelle Wong, Arianna Gellini, Gabriel Leung, a.o. Workshop Leaders: Au Step, Jörg Scheller, Jens Badura, Li Zhenhua, a.o. 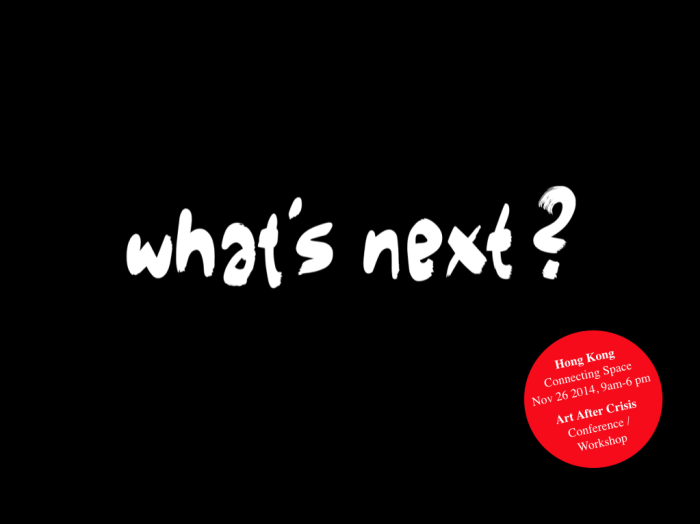 “What’s Next? Art after Crisis” discusses in theory and practice the possibilities of the art of the next society, the impending paradigm shift, the latest developments of the ‘art’ system as well as the changes in the conditions of production, distribution and reception of art today in a global context. In two plenary sessions, three workshops and an evening program, these subjects will be addressed and discussed with positions from theory and practice from Western and Eastern art.